Shopping the Target clearance is probably my favorite way to save. Once you know how and when Target marks things down, you can easily find stuff for 70% off, not just lame stuff that nobody wants, you can find GOOD STUFF! How do you find Target clearance items? The clearance items at Target will have a red sticker. In the lower right hand corner you will see the price they are currently marked down to. The lower left hand corner will let you know what the origninal price was. Plus, you can find the percentage of the markdown in the upper right hand corner, so you don’t have to do the math! They make it super easy on us. Clearance prices generally end in either a 4 or an 8. The percentage it is marked down is 70% off! Where do you find Target clearance items? Most of the Target clearance items are found at the end of the aisles, usually on the endcap facing a wall. You can usually see a clearance sign posted at the endcap. When items are marked down for the first time, there is a good chance you will still find them in the aisle. Once they have several items on clearance, they will get moved to an endcap. How do they mark things down? Target has a system for marking down their clearance items. In general the markdowns go 30%, 50%, & then 70% off. There are exceptions to this rule, sometimes more popular or everyday items will start at 15% off. Often, you will find that the food, healthy & beauty, electronics and Lego’s will start at 15% off. Holiday and seasonal items follow a different markdown schedule, they will get marked down to as low as 90% off. SWEET! Generally, they seem to mark things down to the next level every 2-3 weeks (sometimes it is longer, or shorter). So, if you see something in sporting goods that you are interested in that was just marked down 50%, you may want to check back in a couple of weeks. Sometimes you may come back and the item will be gone. If you see an item that you really need, it might be a good idea to buy it at 50% off. If I am buying items for the future use, or for my gift closet, I usually wait to see if I can get it at 70% off. What days to items get marked down? Generally, Target marks down their items Monday-Friday. Each department is generally assigned a certain day that they do their markdowns. Knowing this schedule is the key to finding great deals at Target. Holiday items don’t follow a set schedule, so they could get marked down on a weekend. Below, you will find the Target markdown schedule. Please note that some stores may follow a different schedule, and also departments can change to a different day. As an example, several years ago the markdown for the toy department used to be on a Wednesday, but now the majority of the stores have moved the toy markdown day to Thursday. It is important to mention that there is a good chance that clearance prices will vary by store. 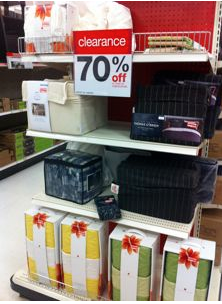 You may find some towels on clearance to 70% off at one store, and run over to another Target to try to get more and find that their towels are only marked down to 50% or even 30% off. 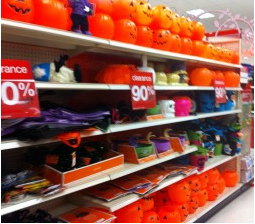 Holiday Target Clearance Markdowns: The holiday clearance is fun, fun fun! These items get marked down to as low as 90% off. That’s like nearly FREE! The holiday items will go to 50% off the day after the holiday. If the holiday involves bagged candy (Halloween, Christmas, Valentines), then the candy will usually start out at only 30% off. Usually a week or so later the items will get marked down to 70% off, a few days after the 70% markdown, everything that is left gets marked down to 90% off.